Pictured left to right: STC Board Member Mary Warnell, Gulfstream Aerospace Corp. Senior Vice President of Administration and General Counsel Ira Berman, TCSG State First District Board Member Mary Flanders, STC President Dr. Kathy Love, Georgia Representative Ron Stephens (R-Savannah), TCSG Commissioner Ron Jackson, STC Board Member Terry Lemmons, STC Board of Directors Chairman Donald Lovette, STC Foundation Board of Trustees Chairman Jim LaHaise, SEDA Board of Directors Chairman David Paddison; SEDA President/CEO Tripp Tollison. 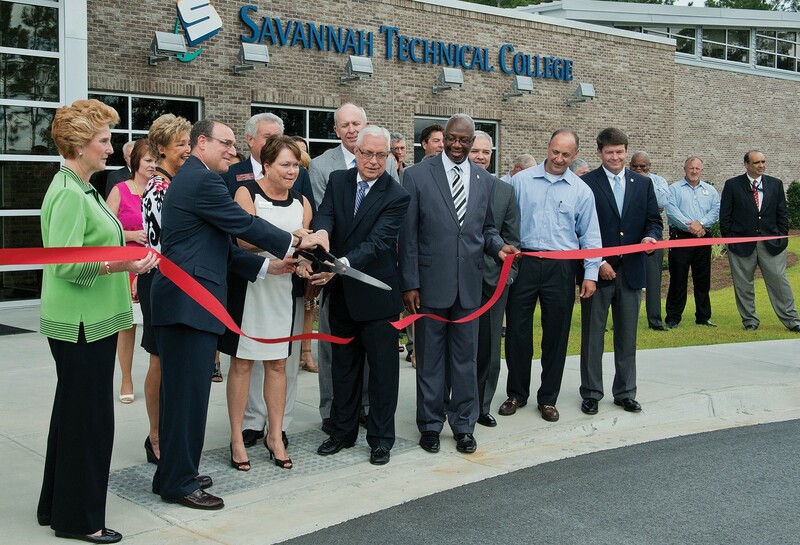 Photo by Savannah Technical College. Technical College System of Georgia Commissioner Ron Jackson, Savannah Technical College President Dr. Kathy Love and honored guests celebrated the grand opening of STC’s Aviation Training Center today. The nearly 30,000-square-foot facility at STC’s Crossroads Campus has a 5,000-square-foot hangar, four labs designed and equipped for hands-on instruction and spacious classrooms. It was designed by James W. Buckley and Associates, Inc. and built by Pope Construction. Savannah Tech’s Aviation Division currently offers several programs of study that prepare students for careers in the aviation industry. These programs include certificates and diplomas in aircraft structures manufacture and repair, luxury craft cabinetmaking, and aircraft electrical equipment repair and installation. The College was recently approved to offer the Aircraft Upholstery and Trim Technical Certificate of Credit. The College is currently accepting student applications for this program scheduled to begin spring semester of 2014. The College is currently seeking FAA approval to offer programs that will provide graduates with the skills and knowledge needed to become certified as airframe and powerplant mechanics. The new Aviation Training Center will help STC meet FAA Part 147 requirements, which govern aviation mechanic schools. For more information about Savannah Technical College’s Aviation Technology programs visit savannahtech.edu/AviationTechnology.